The first half of 2014 has been very exciting and eWIT has been a part of many women-related events. The spotlight was on eWIT’s Anniversary in May. The anniversary event was a very well attended event with key takeaways from the Chief Guests and eminent speakers, speaking on the theme of ‘Ascend – Take Charge’. The Chief Guest was Mr. C.N. Ram of Rural Shores Business Services and the Guest of Honor was Dr. Jayanti Ravi – Commissioner, Higher Education, Gujarat. eWIT is championing the cause of Prevention of Sexual Harassment (POSH) with many governing council members chairing the POSH boards in leading companies as well as conducting trainings for professionals in various IT/ITES organisations. For trainings in this area, eWIT will train and assist professionals. Please reach out to admin@ewit.co.in for the training on POSH. 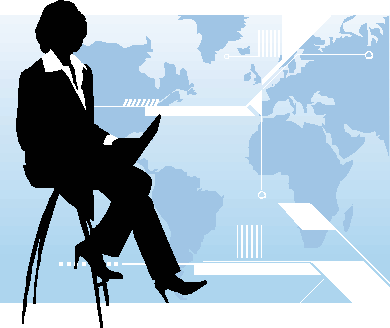 Happy reading updates from around the world regarding Women & Business. 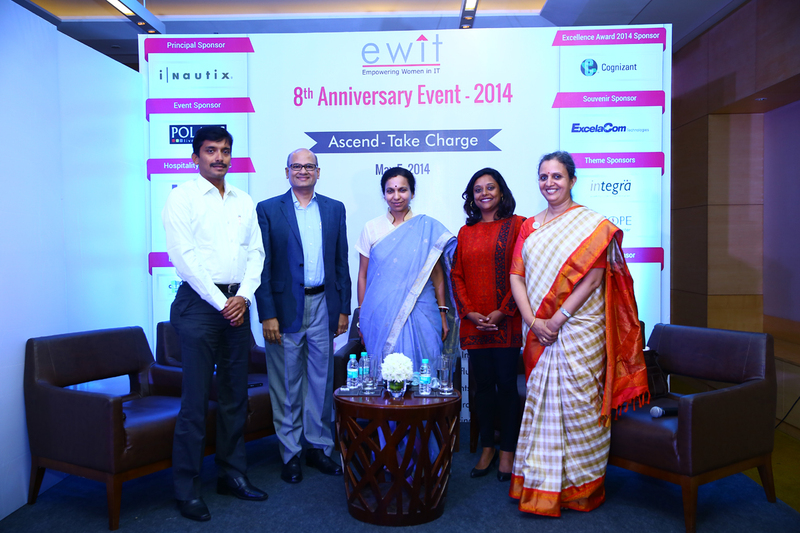 The 8th anniversary event of eWIT was celebrated with great enthusiasm and vigour at the Hyatt Regency on 5th May 2014. The theme of the event, ‘Ascend Take charge’, was discussed in detail by the key speakers who addressed an audience comprising mainly of women representing different companies. The event began with an invocation by Miss. Gayathri. After the initial networking and high tea, the program commenced with the President of eWIT, Ms. Rama Sivaraman’s address. She highlighted that working women should take control of their destiny. Ms. Rama mentioned that the support of family and good infrastructure can make a huge difference in helping women to climb the leadership ladder. The Guest of Honour, Dr. Jayanti Ravi, Commissioner, Higher Education, Govt. of Gujarat, addressed the audience with her insightful thoughts on the theme. She started off on a great note, saying: To ascend, we need to descend i.e., we need to build a strong foundation. She requested all the organizations to invest in silent spaces. Dr. Jayanthi also stressed on the importance of networking and staying connected. She urged all women to be themselves and have faith in themselves and in God. She related an interesting anecdote from Gujarat and her speech was very inspiring to the audience. Ms. Jayashree Mitra, Head, Global Technology Mgmt, Scope International, who wanted to become a fighter pilot, shared her inspiring life story and stressed on the theme ‘Ascend- Take charge!’. She provided great insights and quoted a few examples from her workplace as well. It was a treat for the audience to listen to Mr. Sujith Kumar, location HR Head, Infosys Technologies Ltd. Mr. Sujith shared his experience working with his team of 9 smart women. He highlighted that the key problem was that women refuse to take leadership positions and he had observed this in his very own team during succession planning. He also requested eWIT to address this key problem. According to him, when people are pushed against the wall, they automatically learn to take charge, they emerge stronger, and more powerful, rising to the situation. He shared an inspiring story of a fisherwoman who goes out and catches fish all by herself in this male dominated profession. He also shared story of an orphan girl who successfully got placed in one of the most prestigious IT companies. He cited that these women took charge of their destiny and emerged stronger and successful. He also stressed on the family support and said majority of the successful women in the IT companies say that they owe their success to their mother-in-laws who provide them the support and peace they needed at home to succeed at work. Mr. Sujith quoted that women have started taking charge in the rural sectors as well. The General Secretary of Tamil Nadu Chapter of Indian Federation of United Nations Association (TNFUNA). Mr. Narayanan, distributed booklets on “Women’s Empowerment Principles – Equality Means Business”, which presents a roadmap to companies on putting the Women Empowerment Principles in to practice. This roadmap was derived from large collection of company-submitted examples, titled “Companies leading the Way: Putting the Principles into Practice”, put together by UN Women. To mark the occasion eWIT released its 8th Anniversary souvenir. The souvenir was released by Mr. Mejo John, Facility Manager from Excelacom Technologies - the souvenir sponsors and the souvenir was received by the Chief Guest and speakers. The eWIT excellence award winners from different categories were then felicitated by the chief guests. The event ended with a vote of thanks, thanking all the sponsors and all the patrons who made this event a grand success. With the introduction of the new law on Sexual Harassment, a lot of effort has been underway in terms of understanding the Law, Creation of committees specific to the norms of the law as well sourcing an external NGO to be a part of the committee. Many companies are now getting their ‘house in order’! 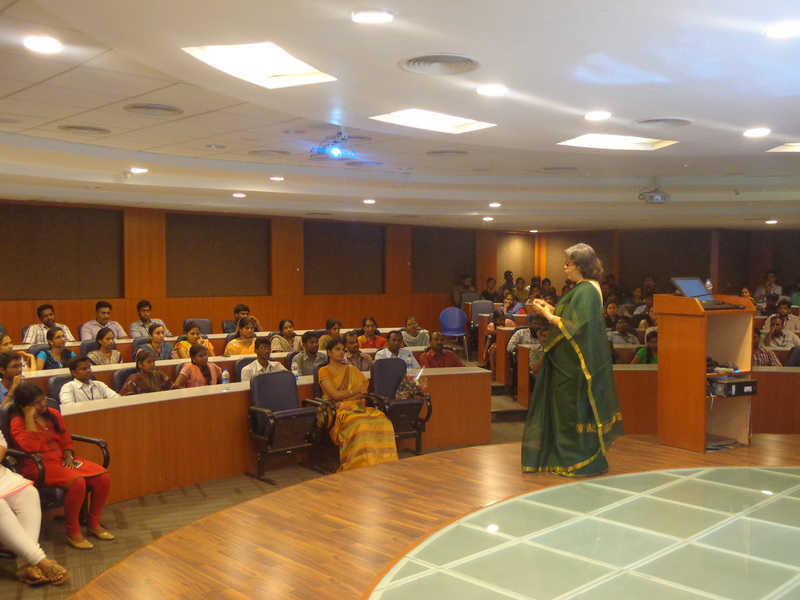 On the request of V.P.Rajini Reddy, Managing Director of Exemplarr Worldwide, Ms. Usha Srinivasan – Director, Ushas Consulting and Advisor for eWIT spoke on May 22nd on the topic of Gender Sensitisation and Sexual Harassment. She spoke to a packed audience of personnel from Exemplarr, who were very keen to know more on the subject. Gender- the word is understood in many different ways! Society and culture play a very important part in defining GENDER. Gender expectations are set even before a child is born and Gender attributes seem to be still hardcoded in our minds!! Even though we are in the 21st century!! The following aspects were covered in her talk, which covered how organisations & personnel can together help reduce sexual harassment at workplace. What behaviour constitutes Sexual Harassment? Why we need to be careful and creating an awareness? What we can do to prevent it? How do we promote the Policy? What do we need to do make ‘workplaces’ safe? The programme was well received and there were many questions posed by the audience. Catalyst has made a report on how the economic empowerment of women can improve a country’s growth and stability, combat shrinking labour forces and contribute to economic development. The excerpt of the report is given below. Catalyst is a nonprofit organization with a mission to expand opportunities for women and business. They are dedicated to creating more inclusive workplaces where employees representing every dimension of diversity can thrive. Millions of other working women face much more difficult life circumstances. Some are single mothers; many struggle to find any job; others support husbands who cannot find jobs. 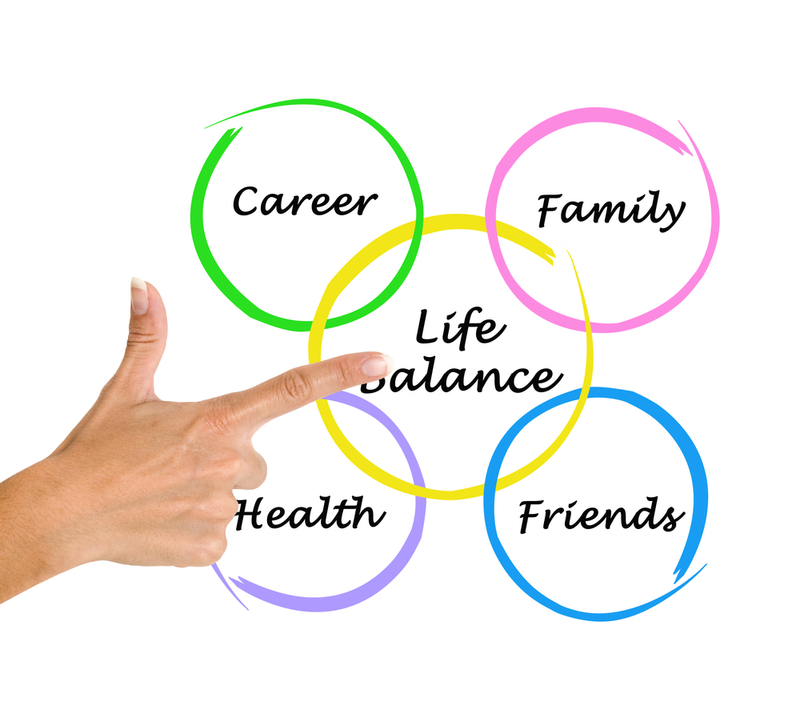 Many cope with a work life in which good day care is either unavailable or very expensive; school schedules do not match work schedules; and schools themselves are failing to educate their children. Many of these women are worrying not about having it all, but rather about holding on to what they do have. Let's look at the half truths we hold dear…..
1. It’s possible if you are just committed enough. I am all for encouraging young women to reach for the stars. But I fear that the obstacles that keep women from reaching the top are rather more prosaic than the scope of their ambition. 2. It’s possible if you marry the right person. From years of conversations and observations, however, I’ve come to believe that men and women respond quite differently when problems at home force them to recognize that their absence is hurting a child, or at least that their presence would likely help. I do not believe fathers love their children any less than mothers do, but men do seem more likely to choose their job at a cost to their family, while women seem more likely to choose their family at a cost to their job. To many men, however, the choice to spend more time with their children, instead of working long hours on issues that affect many lives, seems selfish. Male leaders are routinely praised for having sacrificed their personal life on the altar of public or corporate service. That sacrifice, of course, typically involves their family. Yet their children, too, are trained to value public service over private responsibility. In sum, having a supportive mate may well be a necessary condition if women are to have it all, but it is not sufficient. If women feel deeply that turning down a promotion that would involve more travel, for instance, is the right thing to do, then they will continue to do that. 3. It’s possible if you sequence it right. The most important sequencing issue is when to have children. Many of the top women leaders of the generation just ahead of me—Madeleine Albright, Hillary Clinton, Ruth Bader Ginsburg, Sandra Day O’Connor, Patricia Wald, NannerlKeohane—had their children in their 20s and early 30s, as was the norm in the 1950s through the 1970s. A child born when his mother is 25 will finish high school when his mother is 43, an age at which, with full-time immersion in a career, she still has plenty of time and energy for advancement. Personally, I have never seen a woman in her 40s enter the academic market successfully, or enter a law firm as a junior associate, Alicia Florrick of The Good Wife notwithstanding. But the truth is, neither sequence is optimal, and both involve trade-offs that men do not have to make. 1. What's got to change? One way to change that is by changing the “default rules” that govern office work—the baseline expectations about when, where, and how work will be done. Cheryl Mills, Hillary Clinton’s indefatigable chief of staff, has twins in elementary school; even with a fully engaged husband, she famously gets up at four every morning to check and send e-mails before her kids wake up. Louise Richardson, now the vice chancellor of the University of St. Andrews, in Scotland, combined an assistant professorship in government at Harvard with mothering three young children. She organized her time so ruthlessly that she always keyed in 1:11 or 2:22 or 3:33 on the microwave rather than 1:00, 2:00, or 3:00, because hitting the same number three times took less time. Let us rediscover the pursuit of happiness, and let us start at home. If women are ever to achieve real equality as leaders, then we have to stop accepting male behavior and male choices as the default and the ideal. We must insist on changing social policies and bending career tracks to accommodate our choices, too. We have the power to do it if we decide to, and we have many men standing beside us. The 2014 State of Women-Owned Businesses Report has been released by the National Association of Women Business Owners (NAWBO) and Web.com Group, Inc. According to the report, nearly nine out of 10 women business owners (87%) are optimistic about the economic outlooks for their businesses this year, which is a 12% increase over 2013 findings. When asked what they consider to be very or somewhat important macro issues in 2014, two issues came out on top by a significant amount. Overall, 90% of the 606 women business owners who responded to the survey indicated that the state of the economy was one of their biggest “big picture” concerns followed by business tax issues (80%). In 2014, women business owners will invest more in marketing, customer service, and hiring but less in product and service enhancement. Key investment areas in 2014 were ranked by the survey respondents, and marketing came out on top with 78% of respondents stating that marketing would be a key investment for 2014. Customer service (68%), product and service enhancements (54%), and hiring (41%) were also identified as key investments for women business owners this year. You can follow the link at the beginning of this article to read the complete 2014 report. Click the following link to learn more about the 2013 State of Women-Owned Businesses Report. Check out the infographic below for some of the highlights from the research study.